Mmm..blackberries...we just made a blackberry cobbler from blackberries we picked. I had a post about it on my blog! Enjoy your blackberries, Heidi! They look like little bird nests, with lots of little green eggs. Very cool. 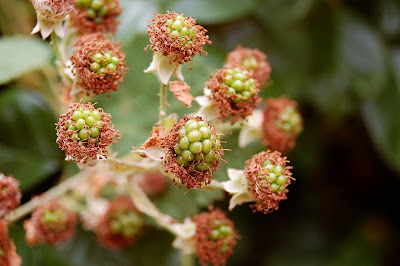 I was just thinking about blackberries and wondering how they are coming along...we have removed all the blackberries from our place so I can't just walk out the door and pick them anymore. But we will be off to the neighbors in a month or so to pick to our heart's content. My mouth is starting to water... I'm so ready to eat and bake with blackberries! Thanks for the comments, ladies. Nancy~ That is just what I thought! What delightful little nests of green eggs!